So, let’s say that you are celebrating a birthday; you baked a beautiful cake (or bought it, no judgment here! ), you lit the candles and started the people gathered in singing “Happy Birthday”. By the time you are all done with the song, your beautiful cake is covered with puddles of waxy melted candles, sticking to your lovely frosting, mucking it all up! You end up peeling pieces of wax off your cake, or pulling those plastic spikes out. Either way, you are left with a moon-like landscape filled with craters and pockmarks… Sounds familiar? Well, you are not alone! Loree Sandler experienced an Aha! moment as she watched the candles on her son’s 12th birthday cake melt into her labor of love, leaving it, you guessed it – less than attractive. Wouldn’t it be incredible to have candles that were edible and somehow added to the cake as they melted onto it? This is usually where most of us stop, but not Loree. This is where her journey of discovery, hurdles, victories, stumbles and success only began. I met Loree at the International Fancy Food show in San Francisco this year. Her beautiful candles are visually attractive, elegant and well designed. Wait for it… they are made out of CHOCOLATE! Yes, you read it right! 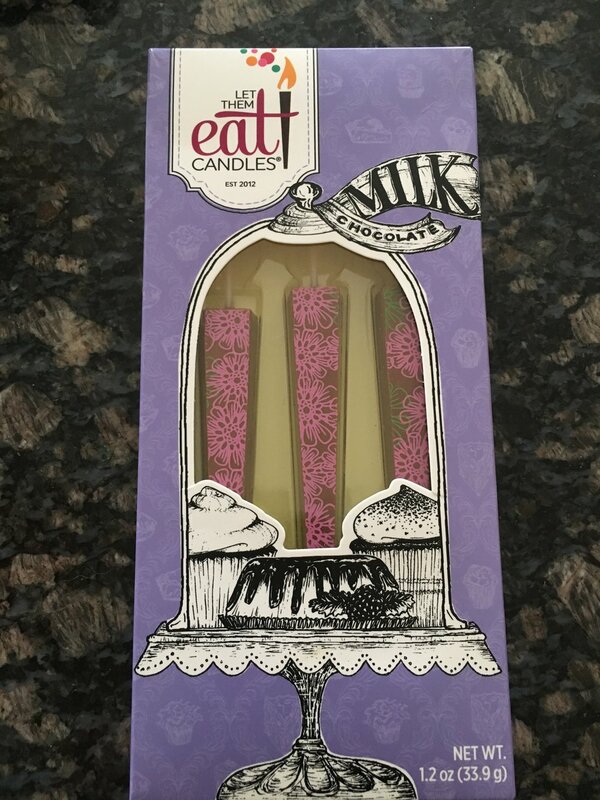 Chocolate candles! This brilliant idea seems so obvious now that Loree has presented us with it. Duh! The name of her company is, of course, Let Them Eat Candles! Recently, Loree shared with me her story that began with a degree in economics, a stint as a paralegal, and as a stockbroker, a young family and a home renovation that led to an interest and a degree in architecture. Juggling professional life with the needs of a young family with 3 boys, Loree took a break from architecture and focused on home life. Even then, the energy that has propelled her through life and learning (and comes through so clearly in conversation), kept her seeking new opportunities; volunteering, learning and exploring. All of these aspects of Loree’s education and experience will converge to assist in the creation of a new business. Loree’s new quest began with her Aha moment with her son’s birthday cake. As she watched the familiar goop forming on her labor of love, it occurred to her: why not chocolate candles?? She talked to local bakeries, started classes at the French Pastry School, realizing her brainchild was a new concept for everyone. What followed was a steep learning curve involving the many aspects of owning your own business. Not registering her company, not realizing the importance of the packaging’s color scheme in attracting customers, were just a few of the first challenges. Sharing a kitchen with other entrepreneurs proved to be detrimental to a chocolate-based business, since the environment was too warm for the chocolate to crystalize properly. At that point she found a kitchen for 12-hour shifts and produced 50-60 boxes at a time. Though her product was selling, it was not flying off the shelves. “It felt more like a hobby than business” Loree summarized that period. But she did not give up, motivated by a deeper guidance. “I want to demonstrate to my kids that you have to stick to it, it’s not all fun and game.” She shared. The summer of 2015 brought a big break. The Grommet, a platform for unexpected, innovative products and gifts was excited to contract with Loree, realizing there was nothing in the market like this new product. In a complicated contract, guaranteeing the first 1200 boxes and providing the shipping, Grommet embarked on a relationship with Let Them Eat Candles. Overcoming more hurdles, the product launched in February of 2016, not making the original goal of the holiday season. Despite the less than optimal timing, inventory was depleted within 30 days! People recognized a terrific product when they saw it! Who says you cannot trust the power of the people? Next came preparing for the One of a Kind show in Chicago. This included working with a co-packer, redesigning packaging, and getting shipment of a pallet of candles… Quite a nail biting process!! To her delight, shoppers loved Let Them Eat Candles and she sold tons of products! Let Them Eat Candles comes in a package of 3 candles; representing past, present and future. Loree does not recommend using more than 3 on the cake: “By the time you light your 7th candle, the first will have already self-extinguished. I actually love the idea of honoring the past, treasuring the present and respecting the future. What a heartfelt, thoughtful way to celebrate. What will we see next from Let Them Eat Candles? Getting into restaurants, packaging individual candles for cupcakes and gifts and more, are all on the agenda. Loree’s journey continues to unfold, introducing new challenges and more growth.